How Do Responsible Gun Owners Confiscate Guns from Mental Ill Friends and Relatives? What if your gun carrying friend or son is losing it and you are afraid for his life or the life of others. What do you do? What can you do? Let’s say he legally owns guns and has a legal concealed carry permit. He hasn’t been judged mentally ill by a judge, but he is clearly dangerous. What if your state doesn’t have a gun violence restraining law? I’ve talked to police officers and sheriffs who have had to confiscate guns from people who were making threats. As you can imagine, it’s not their favorite thing to do. They also don’t have the manpower. In 2012, in Washington, if the police didn’t have a legal process to use the couldn’t act. They just had to wait until the disturbed person crossed a line. We focus on the mass shootings but, many guns deaths are from suicide. I’ve heard stories of how people in the military do this, but will how it is handled in that culture carry over to civilians? This is an issue responsible gun owners really need to own. The issue of gun confiscation has become an internal cultural issue for gun owners. Laws can address due process, legal rights and how this is done, but there needs to be a cultural understanding among gun owners about the need to remove guns from people. The NRA is never going to bring up or support a bill like this, so will responsible gun owners get behind firearm restraining order laws? If not, please share with the process you use internally to protect your fellow gun owners from themself or others when they have gone off the rails. I don’t want to be the “gun grabber” in this situation, but someone needs to be, I want it to be you. 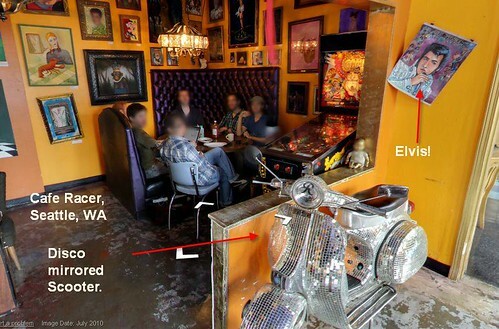 On May 30th, police believe Ian L. Stawicki was armed when he entered Café Racer in the University District in Seattle at 11 a.m. He opened fire, killing four people and wounding another. About a half hour later, Stawicki shot and killed 52-year-old Gloria Leonidas at Eighth Avenue and Seneca Street, near Town Hall on Seattle’s First Hill, according to police. Yesterday the ABC affiliate station KOMO ran a story revealing Ian Stawick had a concealed weapons permit and that Walt Stawicki, the father of accused killer, says he knew his son was troubled and was getting more volatile, but believed there was nothing the family could do to get the concealed carry permit revoked. “The response to us was, there’s nothing we can do, he’s not a threat to himself or others, or we haven’t had a report of it, or we haven’t had to pick him up – call us when its worse,” Walt Stawicki said in a Thursday morning interview with KOMO Newsradio. In the rest of the story you hear of a family that knows there is a problem, but doesn’t know what to do to protect the safety of others. The father was hoping there was some minor incident with his son that would allow an intervention. How would you help this father if he came to you asking for advice? Instead of going to the usual experts I wondered what if Walt Stawicki had asked someone who strongly believes the best way to protect his children involves arming himself and others like Stawicki’s son. Imagine if two weeks ago Walt took this son’s problem to Tim Schmidt, the head of the United States Concealed Carry Association. -Signed, Imaginary Walt Stawicki, Seattle Washington. This is a scenario that I’m sure many families and communities have had to deal with. I know the fear of a partner getting violent drives a lot of restraining orders, but how is the matter complicated when the person has a concealed carry permit? I can already hear the cries, “If he wanted to hurt someone he could have used a knife or a car, do you want to ban all knives and cars! ?” Yes, he could do that, and no, I don’t want to ban all knives and cars. So save the strawman arguments for YouTube comments. The father knew there was a problem. His son’s weapon of choice was a gun, not a knife. A weapon that, because of his ability to easily and legally get a permit, gave him the official blessing to keep a handgun next to him ready to respond to his emotion with lethal force on a moments notice. Now you can argue, and people will, that revoking the CCW would do nothing since he could continue to carry illegally. And guns don’t kill people yada, yada yada, bark, bark, woof, woof. But what would the action of revoking the CCW say to the son, the community and the police who issued it? What about the message it sends to the son? Will he flip out and threaten to shoot anyone who tries to take away his guns? How he responds and how he interprets this will also tell us something about whether he should be able to maintain his CCW permit. If the father wanted to get the CCW permit revoked without getting his son committed for mental health treatment (which might not have been a bad idea in retrospect) he could go about setting up the “minor incident” he was hoping would happen. Here is what the Washington State laws says about concealed pistol license — revocation. How can you get that firearm forfeited? If the son was carrying out and about while drunk or stoned. So I’d tell the dad it’s a two step process. First, notify the police he is carrying while drunk, they will then require him to forfeit his firearm. Next, notify the police that his firearm was forfeit because he was carrying while drunk. His concealed pistol license will be revoked. When a driver’s permit is revoked one message to the community is, “This person no longer can be trusted to drive in public.” Can people break the law and drive without a license, sure, but the process is in place to help the community protect itself from people who have become dangerous to themselves or others because of mental or physical problems. If you know any seniors who have had their licenses revoked (or their keys taken away) you know that they usually have the self awareness that they have a problem. They might not be happy about it, but they agree with the decision and they want to remain law-abiding citizens who understand they have a duty to protect themselves and others. In contrast, the gun manufacturers lobbying firm, the NRA, just wants more guns out there, they aren’t really that picky if they are in the hands of terrorists, criminals or law-abiding citizens. They don’t really care if you have 1000 hours of training in real life situations before you get a CCW permit or if you don’t know a trigger from a hammer. Speaking of training, if you read “How to Get a Concealed Pistol permit” laws in Washington you will find an amazing fact: There is no training required to get a concealed pistol permit in the state of Washington. Zero. Nada. You don’t even have to watch a video. Now, I’ve given the father and the family advice on what to do and how to go about getting a CCW license revoked. I think it would make a difference, and could prevent a tragedy. Will the head of the USCAA offer equally good advice to help prevent this tragedy? Will the members spend their energy thinking only about how getting guns out of the hands of one disturbed person with a CCW permit is going to impact them? If they say it’s just “a crazy person” will they spend energy ensuring that “crazy people” ( or all the people who have serious mental health problems) get entered into the National Instant Criminal Background Check System? Note: The NICS’ database of mentally ill people has less than 20% of the records it should. How they respond to this fathers plea for help can tell you just how serious they are about policing their own community, whether they will help work within the legal system or ignore reasonable requests and fight against the desires of a family and a community to be safer.